As user experience professionals, we all realize the importance of getting real insights from real users and not just making decisions based on a hunch. So what can you do if you’re a designer who doesn’t have trained researchers on your team and you want to go beyond throwing your prototype in front of a few friends? Well, here’s some help to get you started! This month and next we’ll lay out some steps so you can learn basic research skills and start to collect your own insights. This month, we’ll focus on preparing to run a study. In January, we’ll cover things to think about when you’re actually doing the research and need to roll up what you’ve learned into insights. A well-designed, practical, usability study can tell you how users respond to your design and give you plenty of input on how to improve it, whether your design is a low fidelity prototype or a fully functioning product. Focus on usability testing and leave the interviews, surveys, and other techniques to the pro researchers for now. What are you hoping to learn from the test (the objectives)? Your objective might be to see what issues participants encounter with your site when trying to find recipes they can cook for their family, or what keeps them from finding a car they may want to lease. Who is your target audience and how will you find people like them? Are you more interested in professional chefs or stay-at-home moms? People who work full-time and need to make a quick weeknight dinner? And how will you find those people? Can you recruit them from your site with a tool like Ethnio, find them through a local cooking Meetup, or at a mommy and me yoga class? Recruiting the target audience may take some time and effort, so if finding those people is impossible then run the study with anyone who approximates them. It’s best to NOT use direct friends and family – people 1 or 2 levels removed from you is fine. What will you ask the participants to do (what tasks will you give them) to address your objectives? It’s important that you GIVE PARTICIPANTS SOMETHING TO DO with your site and NOT ASK THEM HOW THEY FEEL or whether they like it. A great task would be “Find a recipe you can cook for dinner tonight” or “Find a price for a car that has the features you want.” People are lousy at predicting what they would do so don’t bother asking them, just see whether or not they can complete the task you’re giving them. Before you go too far, it’s ESSENTIAL that you involve the rest of the team, which depending on your company might mean a developer, a product manager, someone from marketing, other designers, etc. Include these key stakeholders throughout the process as a way to get everyone to agree on how you’ll run the test so they’ll be more likely to accept the results. Write a short test plan to communicate the details of the test. This step is crucial to get all stakeholders aligned. Don’t worry about making it fancy – the plan could be literally a single page. Include in the plan all the things you’ve just worked out with the team: the objectives, the target audience and how will you find participants, and the tasks you give them to do. Once you take these steps you’ll be ready to run your study! In January I’ll give you tips for running the test and turning what you learn into actionable insights. With 20+ years of experience, Carol has led projects around vision and strategy setting, brand retention and building, as well as tactical UX research. Learn more at carolrossi.com and on LinkedIn. Observation is a universal UX research building block. At the same time, it applies to much more than just UX research. Why didn’t we know that Trump was going to win the election? I would argue it was because the pollsters and reporters were so focused on quantitative polling data, and on demographic groups (white college-educated voters, etc.). More nuanced qualitative data collection and, dare I say it, personas, could have helped us understand the American electorate in more detail. Just as the 2000 Butterfly Ballot debacle brought information design and usability to the forefront of the discussion, I would argue that this election brings the need for qualitative research as a whole into the limelight as never before. Where can you use your observation skills in unexpected ways in the next year? Mobile and remote research are the way of the future. As research becomes quicker, more agile, and better integrated into the product lifecycle (we hope), it’s important to be smart about the use of remote tools and techniques such as remote moderated and unmoderated usability testing, remote card sorting, and even remote analysis techniques and tools. At the same time, there’s no substitute for the rapport developed by an in-person connection. Pick your tools and techniques wisely. Mix and match research methods. A single research method won’t necessarily answer all your research questions. Come up with a multi-phase approach, or a tiered proposal. Or create a new research method from the tools you already have. Do you need to conduct an in-person session that’s half usability test and half card sort? Do you need to combine qualitative and quantitative work to see the bigger picture? Do you have one question that’s best answered by ethnography and another that should be addressed in the lab? Think creatively about how to get to the answer you need, even if it’s a combined or hybrid methodology that isn’t in any of the books you’ve studied. And never fear if you don’t get to do everything you proposed — research is an art, not a science, and some is always better than none. Hilary has been working in UX for over a decade, focusing on UX and design research projects for clients large and small in the LA area. Her favorite type of study is ethnography triangulated with quantitative data. As new designers enter the field of UX, it is increasingly important that they know that UX is often more of a business function than a design function. In order to succeed at not only the design aspects but in actually being a change agent for innovation in an industry, the designer must understand their role in the business a be able to drive business decisions that stem from user needs. One of my central philosophies has always been that wherever a user (customer, consumer, candidate, etc.) and a brand intersect is UX. Whether working on a consumer application or enterprise software, the function of design thinking can have a broader impact on the operations of a company by including any user-centric disciplines. In this way, UX can not only improve the products that the customer uses, but also the culture of the company that develops the products themselves paving the way for increased hiring and retention, brand awareness and ultimately revenue. In promoting yourself and growing your career, it is important to be able to tell your story and in order to do this, you must play to your strengths and focus on what you do well. If visual design is not your strong suit, don’t lead with it. Focus on what you are great at and have an opinion about why. Sell yourself on your core skills and use any opportunity to grow yourself in the areas that your are less proficient in – as long as they are of interest to you. Lead by example and show the complete picture of what you contributed. Jon is a Director of User Experience with over 20 years of experience working on digital products at tiny startups and large corporations. His work focuses on bringing an Agile design process to business strategy, bringing research and design methodologies that demonstrate the direct impact UX has on user satisfaction and business goals. He is a UX design leader, having managed and scaled teams throughout Los Angeles but has recently turned his eye toward the Northeast LA design community through NELAUX, a local meetup organization he co-founded. He regularly teaches and speaks on design thinking at local meetups and conferences across the country. Know the Technology. If you want to guide and inform the engineering you should understand the technology. Attend code reviews, ask questions, dig in with developer tools, participate in the design the API. You’ll gain the trust of the development team and get a realistic sense of the design problem. The team will be much more receptive to your UX magic if you make an effort to speak their language. Design for Latency. In the world of consumer ‘smart things’, connecting devices to the cloud or a wireless network can be a real buzzkill. Keep the delight flowing by making sure the user is aware of the system status during some of the more ambiguous moments. Show them that the system is working and/or what can be done to troubleshoot an issue. Make it Clear. A lot of the industrial applications out there are super complex. Since people use these to perform real world, life-or-death tasks, they can only be simplified so much. You can, however, reduce cognitive load by making things clearer. By unifying disparate elements and clarifying the necessary details, the experience will be less obtrusive and the product will make more sense. Jason is a UX Engineer with Leviton where he leads design and research in the company’s smart home division. Follow him @jasongillard. Outcome-based management — Regardless of the maturity of their process most companies now recognize that out-featuring your competition is not how you win in the market. Instead, delighting your customer, making it easy and efficient for them to achieve a goal and providing a modern experience are the factors that keep customers loyal. In a software-driven world, these are measurable success criteria. Companies will increasingly be asking their teams to achieve these outcomes rather than simply shipping features (aka output). This trend will highlight the need for user-centric teams — cross-functional teams that truly understand the motivation behind user actions and are continuously optimizing the customer experience towards those needs. UX’ers will have the opportunity to lead many of these efforts, bring teams closer to their customers and power the engine that drives market-based evidence into how the teams work. Leadership empathy gap — UX leaders have a new opportunity in 2017 as well. As companies large and small hire VP+ level designers they have executive leadership’s ear. These are executives who often have an industrial-era management mindset. And it’s served them well until now. They believe that strategy, direction and creativity emanate from the executive suite. As new UX leaders get installed, it’s their responsibility (and unique opportunity) to bring empathy to the executive suite. These leaders have bought into agile but they think it simply amps up production. UX leaders in these orgs now have the opportunity to show how agile rituals — short cycles, continuous feedback loops and a relentless focus on the customer — can yield far organizational agility (values) through increased usage, loyalty and revenue.You can see these conversations start to play out already in some of the more enlightened companies. 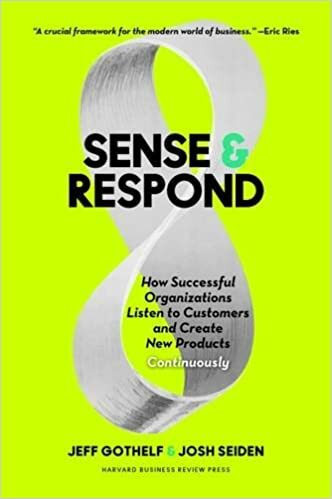 We’ve (Josh Seiden & I) covered these topics extensively in our new book Sense & Respond and strongly believe that this is the future of management, leadership and great customer experiences. As a recruiter, I work with hiring managers who emphasize the importance of having a publicly available portfolio online. We often use Dribbble and WorkingNotWorking to find UX/UI professionals. These platforms are easy to use which makes a difference in a busy world. It’s all about fast and friendly. If you aren’t using these sites, you should consider placing your work there. And, be sure to include a link to your online portfolio on LinkedIn and similar sites. Candidates often forget this. The #1 reason candidates don’t hear about open job opportunities is because their email addresses can’t be found. It should be front and center instead of treating it as a visual design element. So, double check your portfolio and profiles on WorkingNotWorking, Dribbble, LinkedIn, Twitter and other sites to make sure your email address is prominent. Often, the career opportunity goes to the UX professional who has an easy-to-find email address and responds first with their availabilities. We work fast and furious so speed is the key. Want an edge over other candidates? This is it. Andale! Research is everywhere. I continue to marvel at the growth of research. Back in the day, people would write to ask me if they knew of any research openings; now they write to ask me if I know of anyone who they could hire for their research position. We shouldn’t get cocky, as demand for research can lead to commodification, degrading research to a tactical, evaluative tool rather than the strategic powerhouse it is. Research is necessary but not sufficient for innovation. It’s just one of many parts in making business decisions. Research identifies unmet needs but design, technology, service, etc. all figure out how to address those needs. Research assesses solutions but only in certain contexts. Some things can’t be fully evaluated until after they exist (consider the invention of the Post-It, for example). This is an innovation problem, not a research problem. Harness storytelling for teaching and learning. Stories take us through a process of an experience, from the beginning, to the middle, through to the end. Crucially for learners, they can highlight mistakes and failures as much as successes. And stories can tell it like it is, providing a level of authenticity that more traditionally presented instructional material can’t convey. And finally, we respond to emotionally to stories: drama, suspense, pathos, humor all facilitate engagement and end up sticking around in our memory. Steve Portigal helps companies to think and act strategically when innovating with user insights. 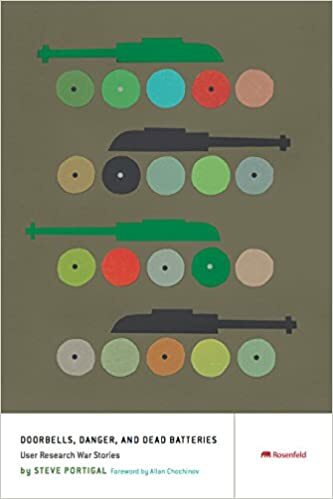 He is principal of Portigal Consulting, and the author of two books: The classic Interviewing Users: How To Uncover Compelling Insights and new, Doorbells, Danger, and Dead Batteries: User Research War Stories. He’s also the host of the Dollars to Donuts podcast, where he interviews people who lead user research in their organizations (including Citrix, Airbnb, eBay and Pinterest). Steve lives in a small coastal town just outside of San Francisco and actively seeks out new ramen restaurants. Senses. Smells, sights, tastes, textures and sounds: what people love and what people hate in sensory experiences are a mixture of both conscious thought in the moment and subconscious memories from the past. It is possible the two are in conflict yet a person cannot easily describe that to you. Test with empathy and use observation and chat carefully. Emotion is in the moment of perception and sensing. Emotion helps focus meaning making for the user so they can make decisions and act faster. However, emotion also constricts cognition. What seems the obvious action to take in a design may not be obvious to the user in the moment of sensing and emotion. Build and test with feeling.